When it comes to healthy eating, you should have a variety of quick-and-easy recipes on hand that you can whip up when you’re on the go. A high-quality frying pan is the most versatile cooking tool for simple, healthy meals. Here are six frying-pan-meals that will suit your healthy habits and busy lifestyle, some non-vegetarian options too. Cauliflower rice is a calorie-saving alternative to grain rice. Choose a medley of vegetables, like zucchini, onion, broccoli and kale, that will accompany the cauliflower rice. After you’ve sauteed the riced cauliflower and veggies, add your preferred sauce and spices. 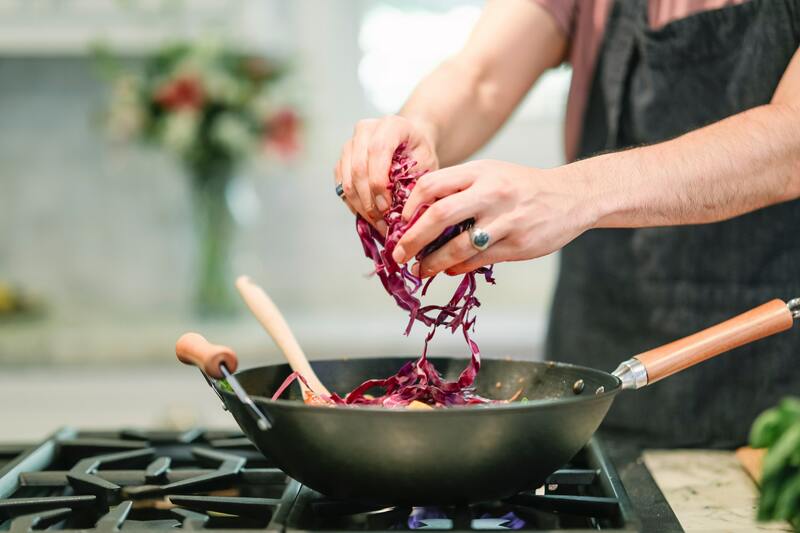 Turmeric, a spice with anti-inflammatory benefits, will give your stir fry a multi-layered flavor profile, a bright yellow color and a hint of sweetness. Other nutritious sauce options include salsa, curry or liquid amino acids. When you’re in the mood for Italian, choose an alternative pasta that will aid healthy digestion. Pea flour pasta cools like a traditional grain pasta, however it is rich in vitamin B and protein. Cook the pea pasta in the frying pan, then sautee with leeks, pesto, walnuts and parmesan cheese. The dish will come out with a bright green hue and will keep well for the next day’s leftover lunch. Go seasonal with rich root vegetables and turkey sausage. First sautee diced and peeled yams, heirloom potatoes, parsnips and yellow onions with olive oil. Once the root vegetables are tender and can be easily pierced with a fork, add turkey sausage to the pan and cook until browned. Break up the sausage into smaller pieces that are a similar size to the diced root vegetables. Add pepper, salt and a ¼ teaspoon of cayenne and garnish with fresh parsley. For a protein-packed meal, pork chops are the answer. In your frying pan, first caramelize 1 yellow onion, roughly diced until translucent with a browned tint. Remove caramelized onions from the pan, add 2 tablespoons olive oil and place pork chops into the pan. Sear the chops on each side and when they have a dark tint, add 2 cans of peeled and diced tomatoes, and ¼ cup of tomato paste. As the chops finish cooking in the tomato sauce, add the onions back in and season with 1 tablespoon of cayenne, salt and pepper to taste. Use your meat thermometer to check the chops and remove the pan from heat once the chops are cooked to 145 degrees fahrenheit. This meal is quick, packed with flavor and only requires a few ingredients. Nothing pairs better with kale than zesty lemon and savory garlic. Create a warm kale salad in a frying pan by first warming some olive oil and cooking freshly diced garlic until the aromatics of the garlic are released. After a minute of cooking the garlic, add roughly chopped kale into the pan — just the leaves, not the stems — and blanche for two minutes until the edges of the kale start to brown. Remove the pan from the heat and juice one half of a lemon over the cooked kale. Season with a pinch of salt and it’s ready to enjoy. A frittata is the perfect meal if you’re looking for an energy boost, as the eggs have omega 3 fatty acids and protein nutrients that support sustained energy. The meal requires 3 eggs, 1 zucchini, 1 red pepper, 1 shallot, 1 cup spinach, 1 cup mushrooms, olive oil, salt and pepper. First, sautee the diced shallot, red pepper, mushrooms and zucchini until slightly tender. While the vegetables are cooking, whisk the eggs until the yolks and whites are completely combined and the mixture has a fluffy look. Stir in the chopped spinach and once it’s barely wilted, pour in the egg mixture. As the egg cooks, swirl the pan and lift up the bottom of the frittata with a spatula, so the uncooked egg will transfer to metal and cook. The frittata should come out looking like an egg pancake. Once the frittata is finished, you can garnish the dish with goat cheese, cilantro or parsley. Frying pan meals require minimal ingredients, cook fast and will support healthy habits. With a solid frying pan, your eating options will be more easy and exciting. What do you like to cook in your frying pan? I would love to know in the comments below or on social media: @mummyconstant.